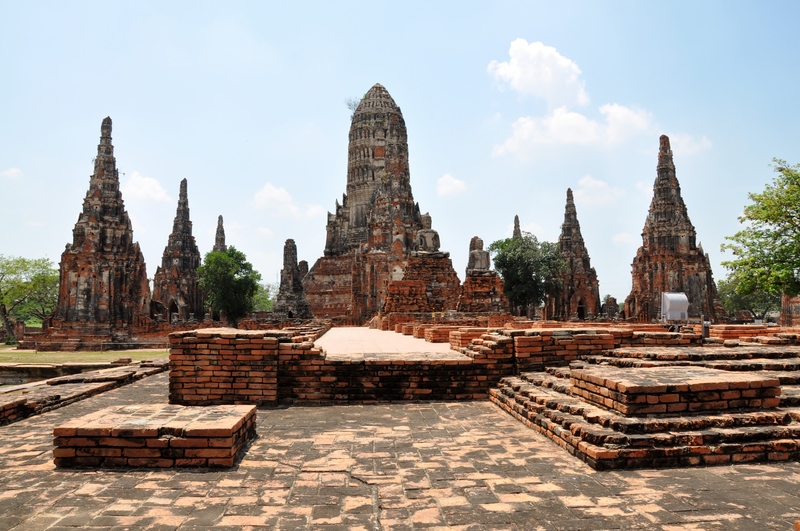 awesome because it is the largest religious monument in the world; we should relocate it to Texas. 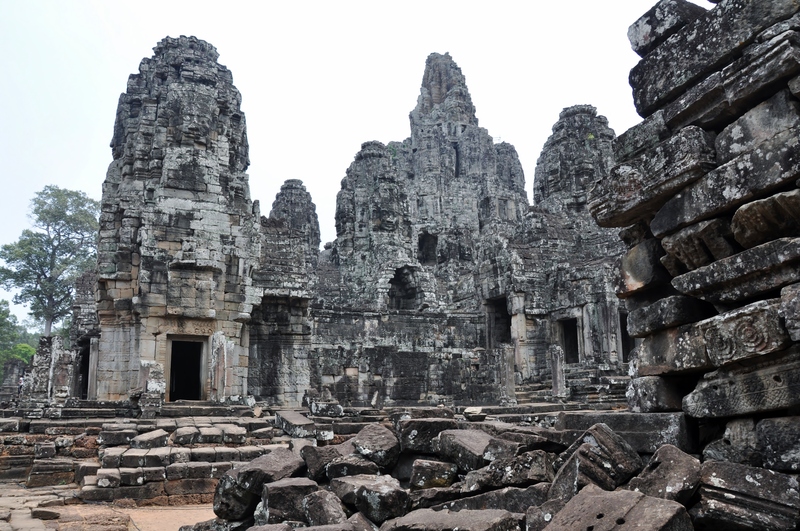 Angkor Wat was built by a Khmer King in the 12th century, originally as a Hindu temple dedicated to Vishnu. The Khmer empire was the largest pre-industrial empire in SE Asia, but I’m sure everyone already learned that in their history classes. 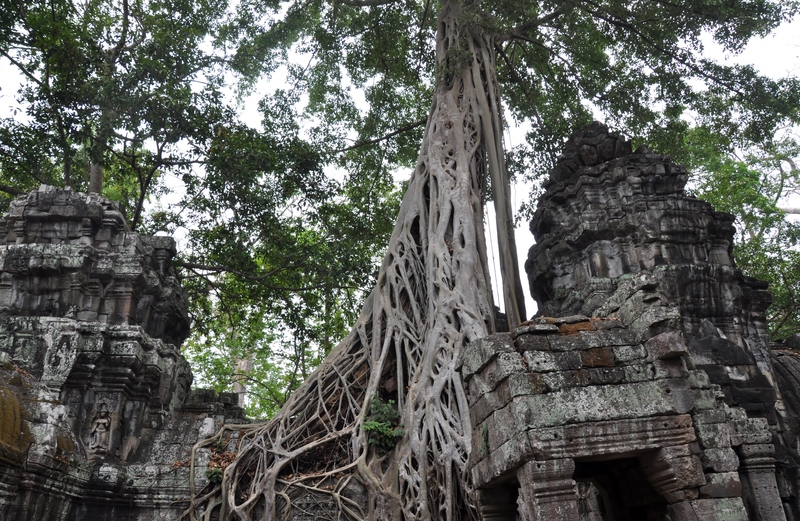 Incidentally, the Angkorian Empire was brought down when the Ayutthayans (see previous entry) sacked the city in the 15th century. 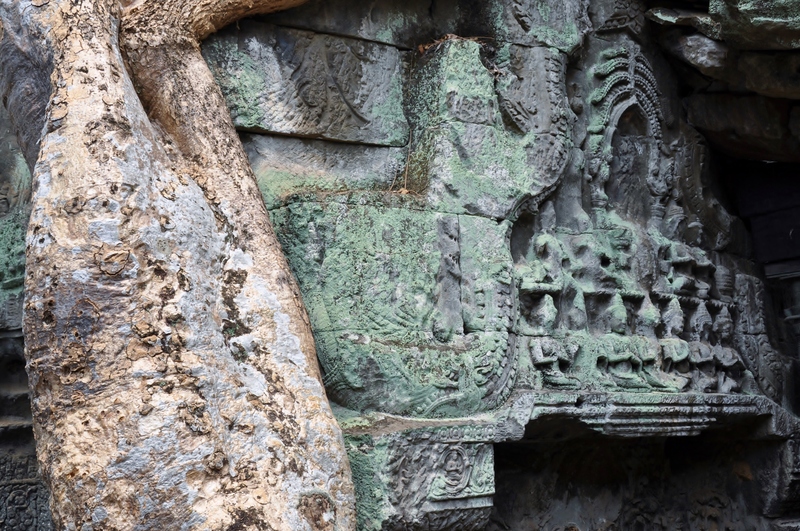 Over the years, the religious observation of the people in the Khmer empires changed. 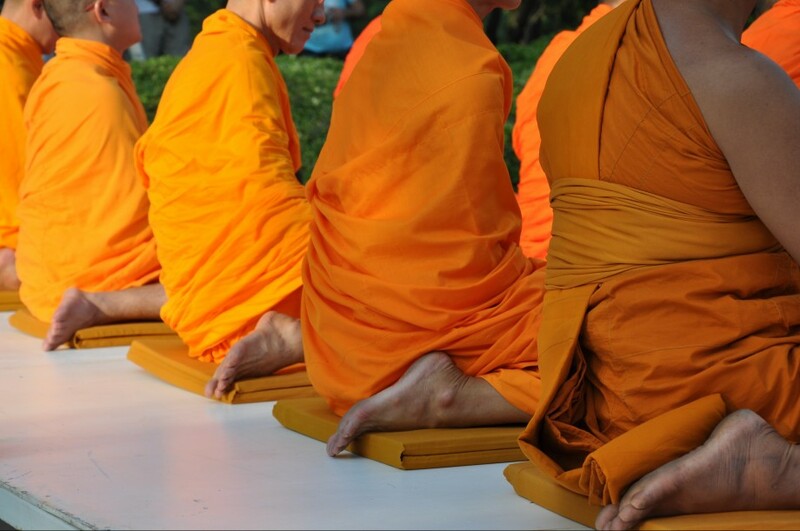 As a result, Angkor Wat is now recognized as a Theravada Buddhist temple. 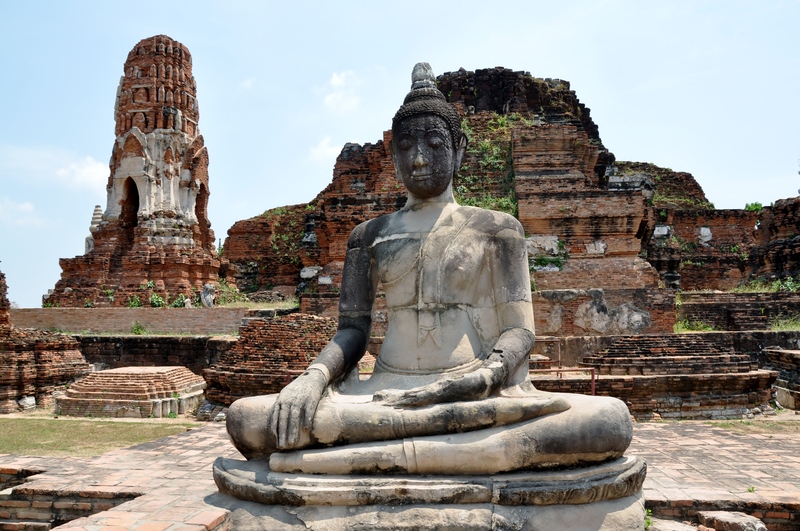 Luckily for the historical sites, when the Khmer Rouge were in power in the 1970’s and during the subsequent civil war, there was not a great deal of damage done to the 1000+ temples. They were too busy committing unimaginable crimes against humanity. 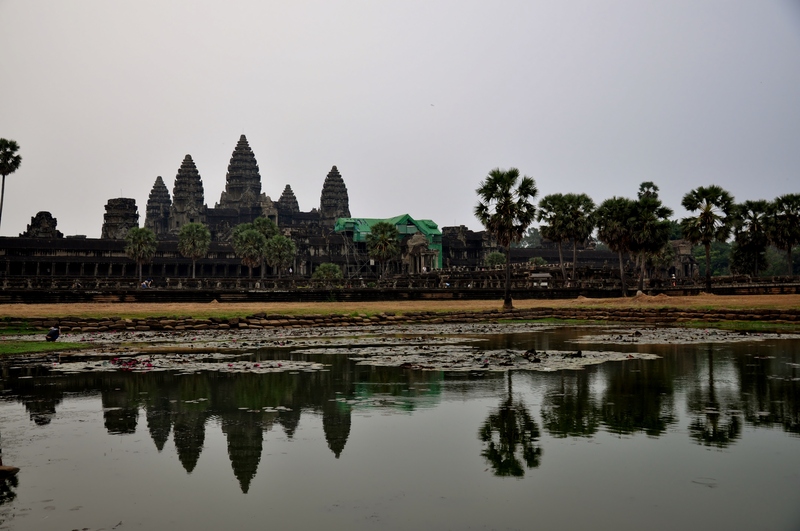 I first learned about Angkor Wat in an art history class at Miami, and I remember distinctly when I was sitting in that class thinking, “Man, I am so hungover right now, thank God we are learning about something interesting”. 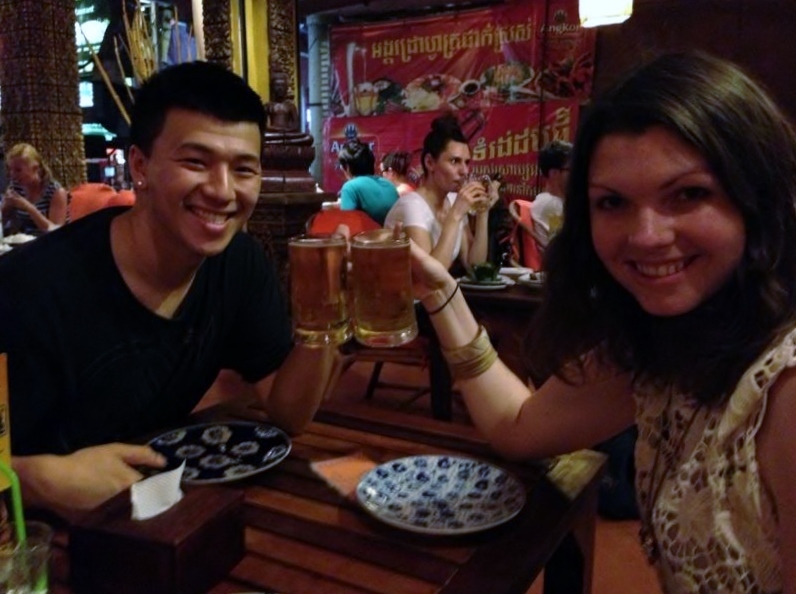 I had a few days off from teaching and my sister Meg was visiting, so she, my friend John and I headed via bus to Siem Reap. As some people know, I have a tendency to faint when I am standing for 1 hour+ in really hot areas (i.e. waiting in line for roller coasters). When it came time to cross the border into Cambodia and I saw that line of people, I knew exactly what was going to happen to me in about 55-65 minutes. I almost made it. When I got to the counter to get my passport stamped, I was literally holding on to the finger print machine so that I wouldn’t fall. My eyes were half blacked out as the guy was asking me what my intentions were. After we got through all that biznass, I crouched down in front of the counter so that I wouldn’t completely lose it and I think he was very surprised to only see a set of fingers gripping the edge of the counter when it came time to return my passport. On the plus side, I didn’t completely black out (only about 75%) and I’m sure I gave all those bored people waiting in line something to talk about. One of the guards offered me some kind of smelling liquid with Chinese symbols on it, but I politely declined and headed back to the bus. At the border, there are lots of casinos. Poi Pet, the border town is like no man’s land. Unfortunately, since my brain was melting out of my head, I couldn’t go in, but Meg and John had a chance to go gamble some Bahts and came out with a significant win of about 60 cents. We continued through the countryside of Cambodia on our way to Siem Reap and I noticed that it was significantly, but not surprisingly less developed than Thailand. 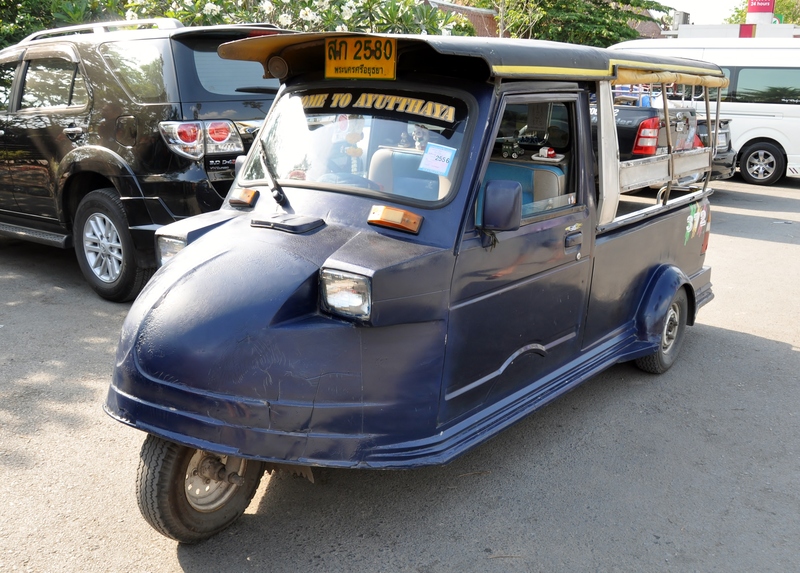 When we got there we took a Tuk Tuk to our hotel. 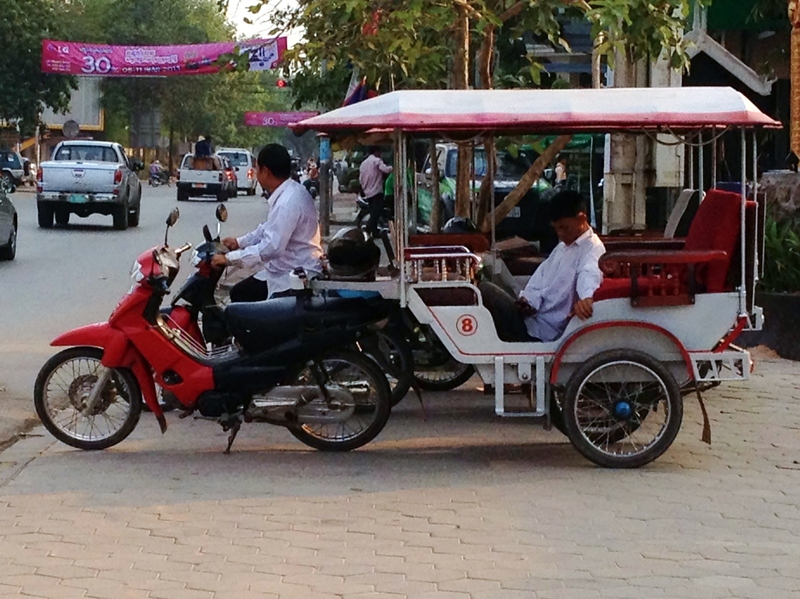 It seems like every city has a different style of Tuk Tuk and so far, Siem Reap has the most death defying version. It’s literally a motorcycle with a hitch welded on to it and it tows a cart that seats 4 people. So safe. until 3:23 AM when I woke up to both of them spooning me at the same time. I reminded them that the alarm was going to go off in 36 minutes because we were going to meet our guide to take us to Angkor Wat at sunrise. I think John got 12 minutes and Meg got about 30. I want some of what he’s on. At 4:30, we were greeted by our guide. Robin Hood. That was his name. He had an unbelievable amount of cheer and energy and every time he said Angkor Wat, he said ANGKOR WAAAAAAT! in a loud cartoonish voice. I think maybe he had been a little bit rattled over the years. He was a child during the Khmer Rouge rule and was then in the army during the civil war. The Khmer Rouge separated children from parents so that the children wouldn’t try to get revenge for whatever happened to their parents and then used the children to carry out torture. About his time in the army he just said, “We had to just keep shooting because if we weren’t shooting them, they were shooting us”. Now, he’s a teacher and a tour guide to support his family. 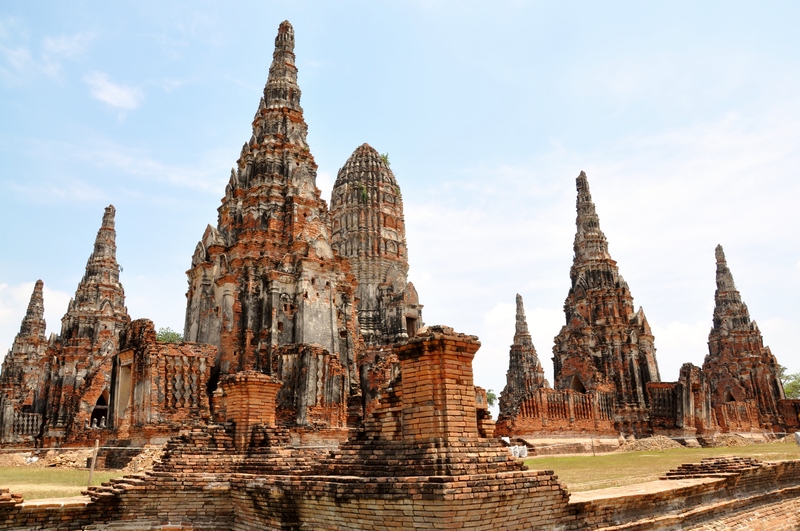 The English in Cambodia was excellent compared to Thailand. Robin Hood spoke very well and we met several other people who had been taught by Peace Corps volunteers. 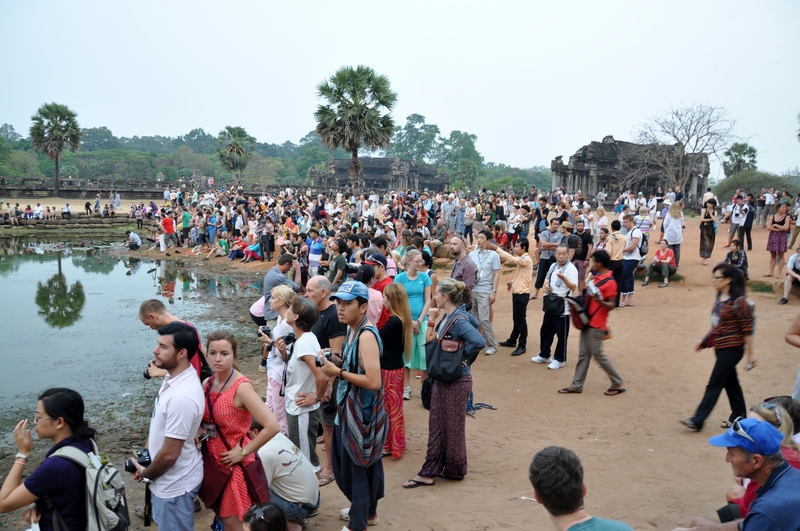 Upon arrival to Angkor Wat at 5:00 AM, I had a better understanding of what a million tourists a year breaks down to on a daily basis. The one thing that was kind of disappointing about the trip was the number of tourists. The sun rose over the main temple like a giant red ball in the sky. It was pretty cool to see, and unfortunately my lack of photography skills prevented me from capturing it, but I won’t forget it. Robin Hood took us all around the temple and explained different carvings and buildings to us. 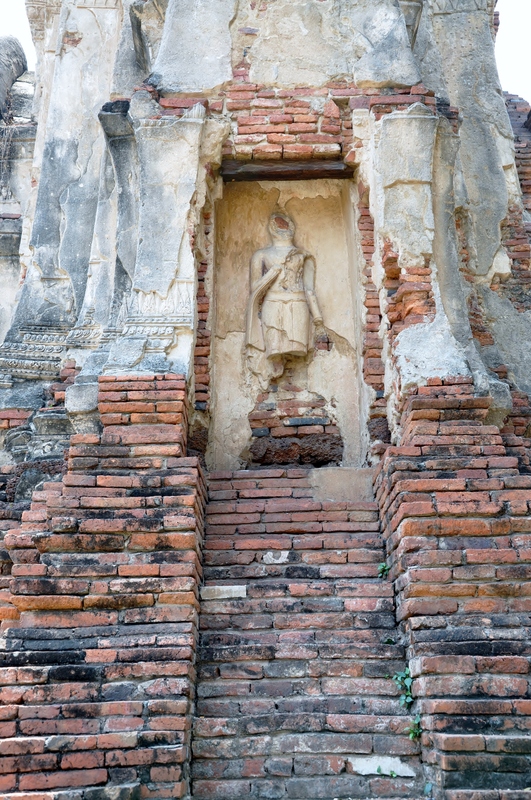 The temple is covered in Apsara dancers (because of it’s Hindu origin) and they are all different. 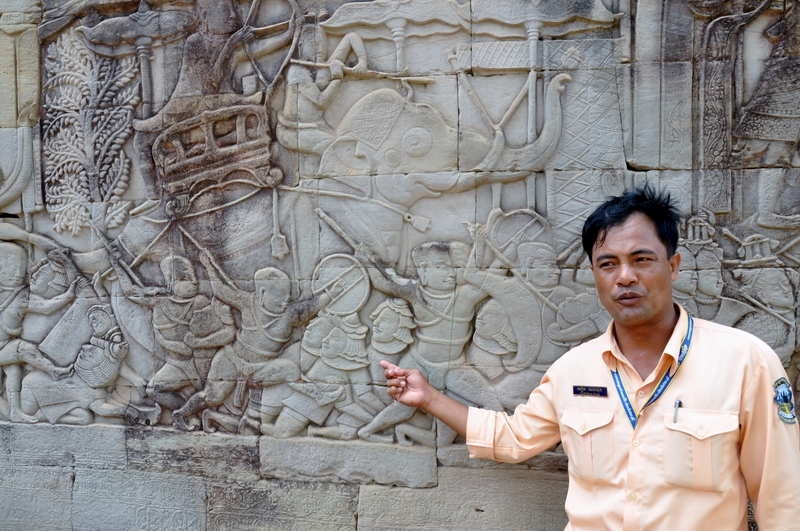 There are also amazing bas reliefs of big battles and important religious events. Our last stop was the top level of the temple which now represents Nirvana. We had to be covered to go up there so John and I went first and checked it out. There was a really peaceful lady monk singing at one of the small shrines which was quickly ruined by obnoxious Russian tourists yelling about getting her photo. I came down and gave Meg my extra shirt so she could check it out and John comfortably fell asleep on a rock. Tomb Raider were filmed. We did not see Angelina, but we did see many trashy looking Russians posing like her for photos. They love to pose, I don’t get it. This was probably my favorite site. 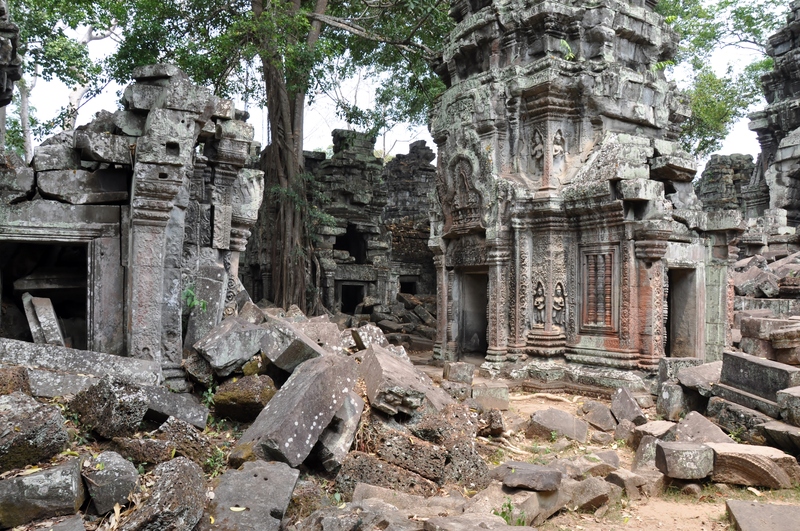 The buildings were significantly more ruined because they had been constructed more hastily than Angkor Wat. 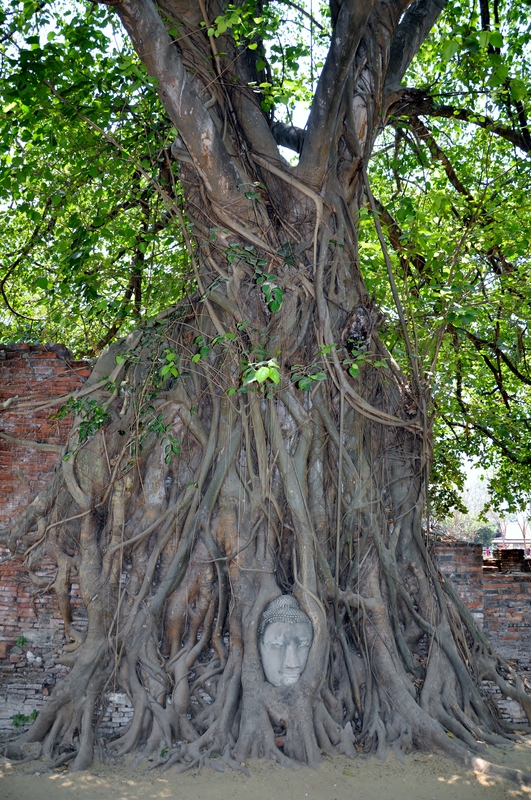 There were Banyan trees growing out of the tops of several of them and piles and piles of ruined stone. Robin Hood had us climb over them to get to other areas which I am sure is not in line with any sustainable tourism standards but, meh. Some areas had been restored, but most of the former university was being eaten up by the jungle. 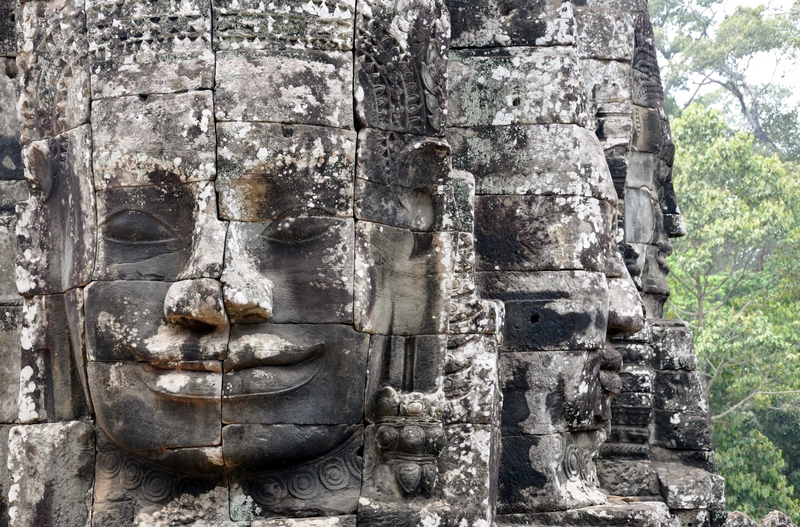 Our next stop was the temple of faces called Angkor Thom. 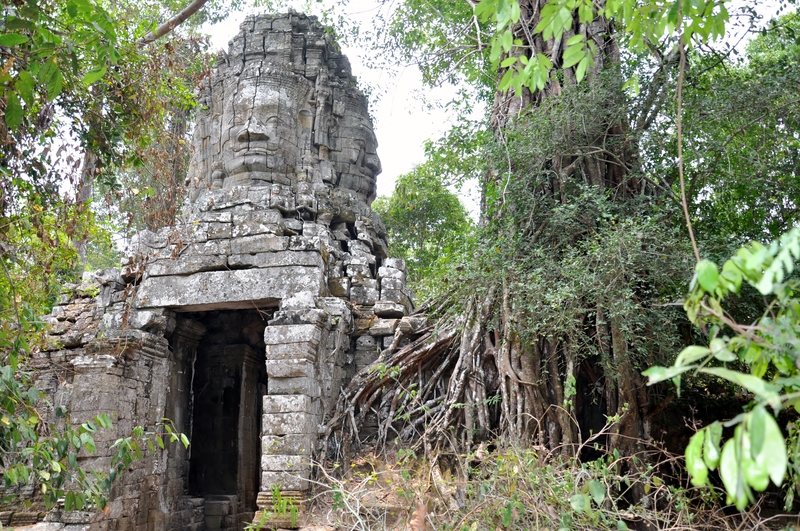 At the entrance to this complex, there is a large gate with a 4 sided face tower and balustrades supported by Naga (the snake god) and demons and humans playing tug of war. 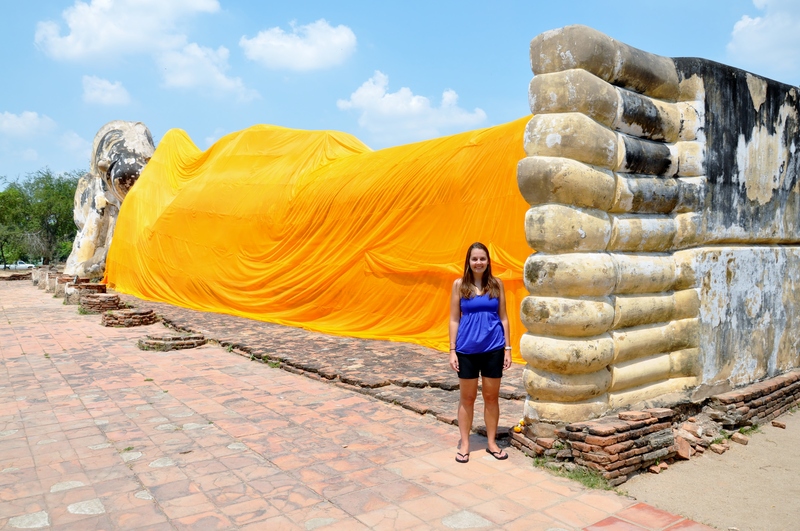 By this point, Meg was about 95% dead so she stayed in the Tuk Tuk and chatted with the driver while John and I made one last push to see this temple. It was really cool. The highlight of this building were the many 4 sided towers with all different faces of the narcissistic king that built it carved into them. Robin Hood had drank a Red Bull so his energy level was reaching cocainic proportions but the rest of us were exhausted so we hopped back in our death cart and went back to our hotel for nap time. 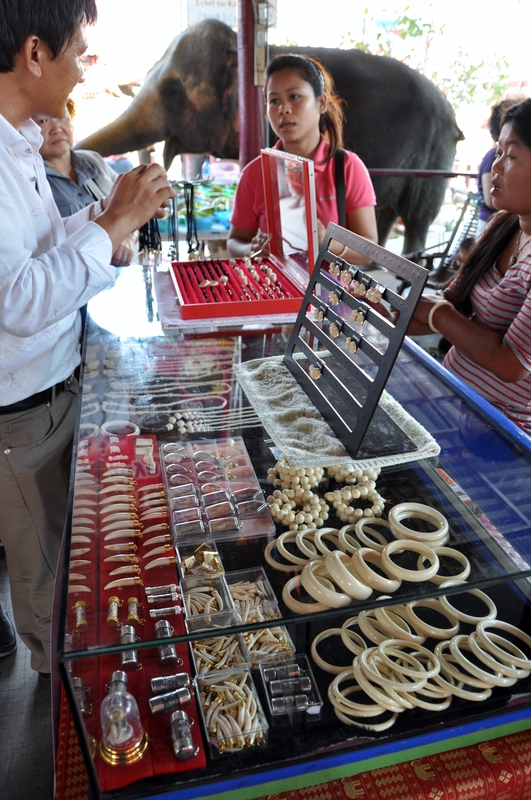 We checked out the night market where I got some cool stuff and then went to have dinner at the same place as the night before. 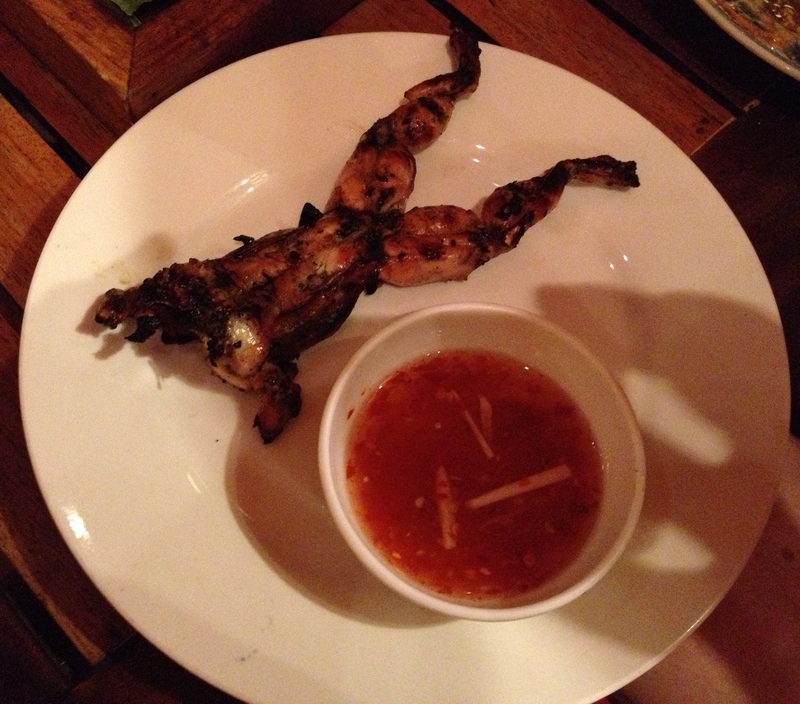 We got some BBQ frogs which were delicious and more Khmer food. 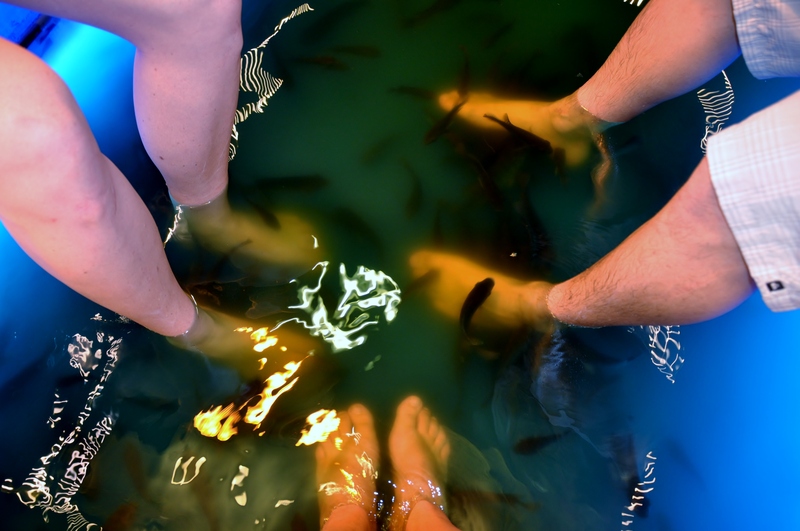 Meg went back to the hotel but John and I stayed out for $2 foot massages. He was on a 2AM bus back to Thailand, but Meg and I stayed until the next morning. Our trip wound down fairly uneventfully except for when our bus drove in to on-coming traffic in Thailand on a 4 lane road. In Cambodia they drive on the correct side of the street, but in Thailand they drive on the left. I made it through the border without passing out which was a big victory. We accomplished a lot in just 2 days. We saw the largest temple in the world, ate some frog, spent USDs as legitimate currency on the other side of the world, all passed out from different causes and survived riding on the most dangerous machine I have ever encountered.